Cowshill has been farmed by the Childs family since 1947, however we can be traced back to the 17th Century as Pork Butchers in Newent.! Our concept of farming at Cowshill is based on the understanding that animals should be reared with kindness and respect. We recognise that their happiness is essential. 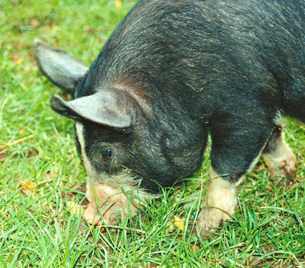 British Lop Pigs originated in Devon and Cornwall but today are the rarest of pedigree pigs, with less than 200 registered females. They are a deep-bodied, docile pig, well suited to a slow fattening to bacon. The meat is of a soft texture and well suited to our ‘Sweet’, ‘Traditional’ and ‘Smoked’ home cures. 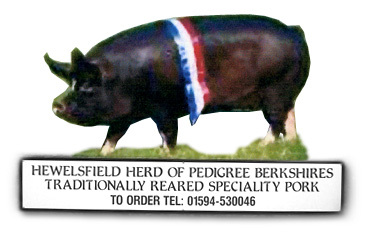 Berkshires are the oldest breed of pedigree pig, dating back some 300 years. Together with the ‘Middle White’ they were the original ‘pork’ breed of the country. They are black with a white blaze, have 4 white feet and half a white tail. It’s because they grow slowly that they have not been included in today’s modern hybrids and therefore there are just 350 registered females remaining. The pork is simply the finest and sweetest tasting. 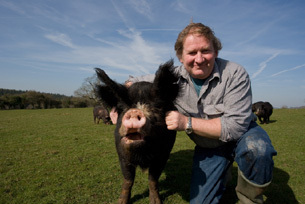 The slower growth rate means the meat, fat and crackling are perfect – no doubt helped by the fact that our animals are fed on a totally cereal based diet, without any additives or antibiotics. They are then transported to their final destination in just half an hour – no stress and no unnecessary food miles. Old Gloucester Cattle are an ancient breed, numerous in the Severn Vale as early as the 13th Century. They were valued for their milk, their beef and providing strong and docile draught oxen. In the last two centuries outbreaks of disease, the introduction of other breeds and the development of intensive farming led to such a reduction in numbers that by 1972 only one herd of 66 remained at Wick Court, near Gloucester. 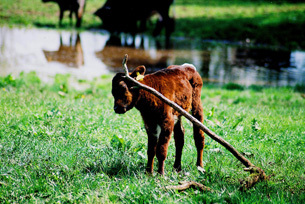 Today cattle numbers have increased from near extinction to around 500 registered females. Old Gloucester Beef is Slow Food Presidia. The steers produce a lean, quality carcase, having sufficient marbling of fat within the meat to give it excellent flavour. Here at Cowshill Farm, our registered Hewelsfield Herd of Pedigree Gloucesters now numbering approximately 70 is one of the largest herds in the world. They are totally gress fed. In the summer months on our south facing pastures, in the winter on our farm produced haylage, whilst housed in purpose designed buildings for horned cattle. They are not fed on any concentrates, growth promoters or chemical additives.